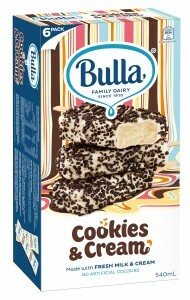 Bulla Dairy have launched a new ice cream range inspired by fairy bread and biscuits. Bulla says it decided to launch the new range after success with its lamington, coconut ice and 100s and 1000s ice creams which it introduced to Australian supermarkets in 2014. The new ice creams come in packs six and are available at Coles, Woolworths and independent supermarkets with a recommended retail price of AUD$6.19.